It appears likely now that Greece will continue, at least for a few more months, with the austerity program that European governments (led by Germany) are insisting on. In return, Greece will receive sufficient “new” funding that will allow it to pay the debt service coming due on its government debt (including debt service that was supposed to have been paid in June, but was not), as well as continued access to the liquidity lines with the European Central Bank that allow it to remain in the Eurozone. But it is not clear how long Greece can continue on this path. The measures being imposed by the Eurozone members are along the same lines as have been followed since the program began in 2010: Primarily tax increases and cuts in government spending. The most important measures (in terms of the predicted impact on euros spent or saved) in the new program are increases in value-added taxes and cuts in government pensions. This has been a classic austerity strategy. The theory is that in order to pay down debts coming due, a government needs to increase taxes and cut how much it has been spending. In this way, the theory goes, the government will reduce its deficit and soon generate a surplus that will allow it first to reduce how much it needs to borrow and then start to reduce the debt it has outstanding. The proponents of this austerity strategy, with Germany in the lead, argue that in this way and only in this way will the economy start to grow. Others argue that austerity in conditions such as where Greece finds itself now will instead cut rather than enhance growth, and in fact lead to an economic decline. The priority should instead be on actions that will lead to growth by raising rather than reducing demand. Once the economy returns to full employment, one will be able to generate the public sector savings which will allow debt to be paid. Without growth, the situation will only get worse. One does not need to argue these points in the abstract. Greece is now in its sixth year of the austerity program that Germany and others have insisted upon. One can compare what has in fact happened to the economy to what was expected when the austerity program started. The Greek program is the work of a combined group (nicknamed the “Troika”) made up of the EU, the ECB (European Central Bank), and the IMF. The IMF support was via a Stand-By Arrangement, and for this the IMF prepares and makes available a Staff Report on the program and what it expects will follow for the economy. The EU and the ECB co-developed these forecasts with the IMF, or at least agreed with them. 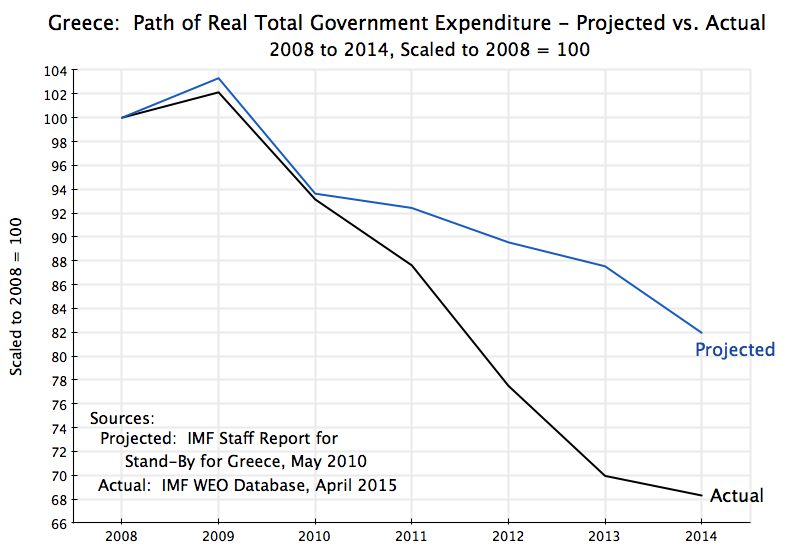 This can therefore provide a baseline of what the Troika believed would follow from the austerity program in Greece. And this can be compared to what actually happened. 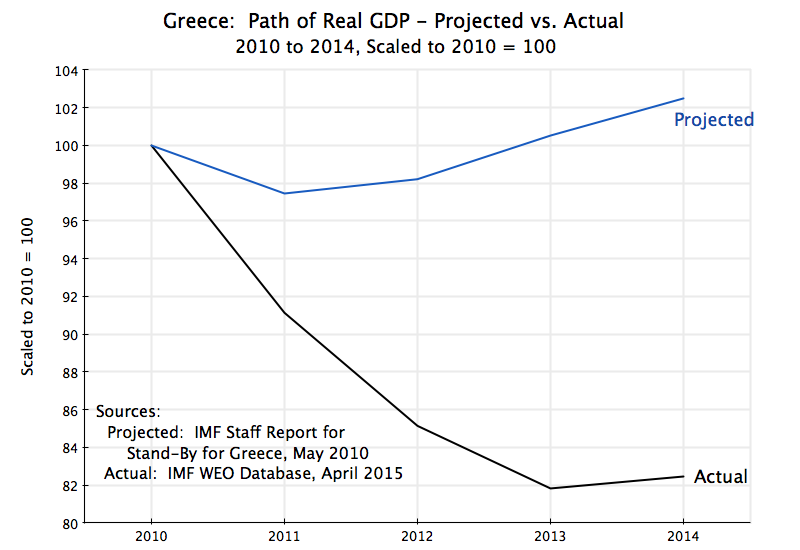 The “projected” figures are therefore calculated from figures provided in the May 2010 IMF Staff Report for the Stand-By Arrangement for Greece. What actually happened can be calculated from figures provided in the IMF WEO Database (most recently updated in April 2015). I used the IMF WEO Database for the data on what happened as the IMF will define similarly in both IMF sources the various categories (such as what is included in “government” or in “public debt”). Hence they can be directly compared. This blog post will focus on a series of simple graphs that compare what was projected to what actually happened. Note that the figures for 2014 should all be taken as preliminary. The concluding section of the post will review what might be done now (and what should not be done now). As will be seen, the program failed terribly. I should of course add that Germany and the Troika members do not believe that this failure was due to a failure in the design of the program, but rather was a result of the governments of Greece (several now) failing to apply the program with sufficient vigor. But we will see that Greece actually went further than the original program anticipated in cutting government expenditures and in increasing taxes. To be honest, I was myself surprised at how far they went, until I looked at the numbers. Austerity was applied. But it failed to lead to growth. 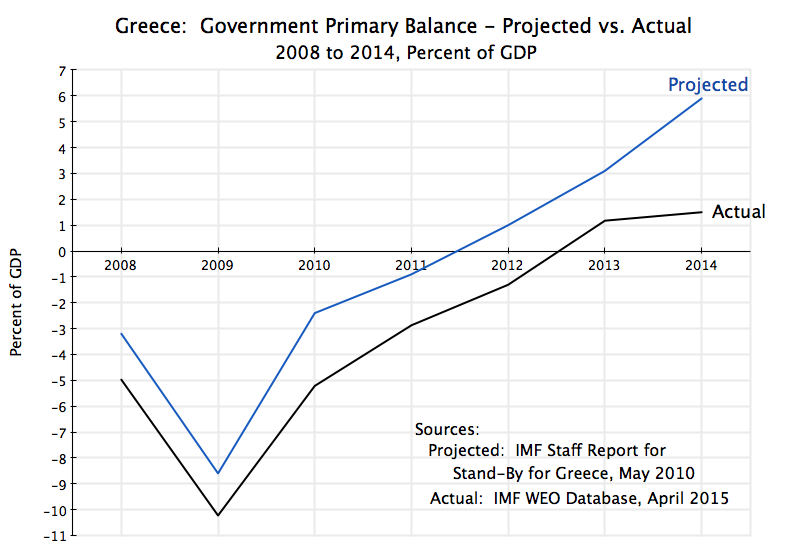 The IMF Stand-by Arrangement for Greece was approved in mid-2010, with output falling sharply at the time. The IMF then predicted that Greek GDP would fall further in 2011 (a decline of 2.6%), but that with adoption of the program, would then start to grow from 2012 onwards. That did not happen. 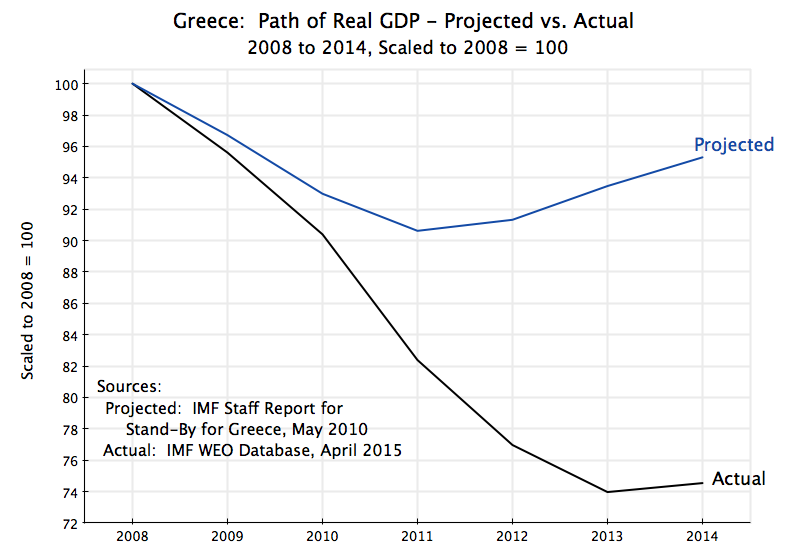 The situation in 2010 was in fact already worse than what the IMF thought at the time, with a sharper contraction already underway in 2009 than the estimates then indicated and with this then continuing into 2010 despite the agreement with the Troika. National estimates for aggregates like GDP are always estimates, and it is not unusual (including for the US) that later, more complete, estimates can differ significantly from what was initially estimated and announced. Growth appears to have returned in 2014, but by just 0.8% according to preliminary estimates (and subject to change). But with the turmoil so far in 2015, everyone expects that GDP is once again falling. The austerity strategy has certainly not delivered on growth. By 2014, real government expenditures were 17% below what the IMF had projected would be spent in that year, were 27% below where they had been in 2010 at the start of the program, and were 32% below where they had been in 2008. Real government expenditures were in each year far less, by substantial margins, than had been called for under the initial IMF program. It is hard to see how one can argue that Greece failed to cut its government spending with sufficient seriousness when government spending fell by so much, and by so much more than was called for in the original program. Tax effort and effect is best measured as a share of GDP. The IMF program called for government revenues to rise as a share of GDP from 37% in 2009 and an anticipated 40.5% in 2010, to a peak of 43% in 2013 (a rise of 2 1/2% over 2010) after which they would fall. What happened is that taxes were already substantially higher in 2009 (at almost 39% of GDP) than what the earlier statistics had indicated, and then rose from 41% of GDP in 2010 to a peak of 45% in 2013 (a rise of 4% over 2010). Taxes as a share of GDP have therefore been substantially higher throughout the program than what had been anticipated, and the increase from 2010 to the peak in 2013 was far more than originally anticipated as well. It is hard to see how one can argue that Greece has not made a major effort to secure the tax revenues that the austerity program called for. With government spending being cut and government revenues rising, the fiscal deficit fell. For purposes of understanding the resulting government debt dynamics, economists focus on a fiscal deficit concept called the “primary balance” (or “primary deficit”, when in deficit). The primary balance is defined as government revenues minus government expenditures on all items other than interest (and principal) on its debt. It will therefore measure the resources available to cover interest (and principal, if all of interest can be covered). If insufficient to cover interest coming due, then additional net borrowing will be necessary (thus adding to the stock of debt outstanding) to cover that interest. The primary balance improved from a deficit of 10.2% of GDP in 2009 to 5.2% of GDP in 2010, and then rose steadily to a primary surplus of 1.2% of GDP in 2013 and an estimated 1.5% of GDP in 2014 (where the 2014 estimate should be taken as preliminary). A rise in the primary balance of close to 12% of GDP in just five years is huge. However, the primary balance tracked below what the IMF program had called for. How could this be if government spending was less and government revenues higher? There were two main reasons: First, the estimates the IMF had to work with in 2010 for the primary deficit in that year and in the preceding years were seriously wrong. The primary deficit in 2010 turned out to be (based on later estimates) 2.8% points of GDP higher than had originally been expected for that year. That gap then carried forward into the future years, although narrowing somewhat (until 2014) due to the over-performance on raising taxes and reducing government expenditures. Second, while the path of government expenditures in real terms was well below that projected for the IMF program (see the chart above), the decline in government expenditures as a share of GDP was less because GDP was so much less than forecast. If, for example, government expenditures are cut by 20% but GDP also falls by 20%, then government expenditures as a share of GDP will not change. They still did fall as a share of GDP between 2009 and 2014 (by 7.7% points of GDP), but not by as much as they would have had GDP not collapsed. The chart shows the path projected for public debt to GDP in the IMF program (in blue) and the path it actually followed (in black). Despite lower government expenditures than called for in the program and higher government revenues as a share of GDP, as well as a significant write-down of 50% on privately held government debt in 2012 (not anticipated in the original IMF program), the public debt to GDP ratio Greece now faces (177% as of the end of 2014, and rising) is well above what had been projected in the program (153% as of the end of 2014, and falling). Why? Again, the primary reason is that GDP contracted sharply and is now far below what the IMF had forecast. If debt followed the path it actually did take but GDP had been as the IMF forecast, the debt to GDP ratio as of the end of 2014 would have been 131% and falling (the path shown in green on the chart). This would have been well less than the 153% ratio the IMF forecast for 2014, due both to private debt write-off and to the fiscal over-performance. Or if debt had followed the path projected in the IMF program while GDP took the path it in fact did take, the debt to GDP ratio would have been 207% in 2014 (the path in red on the chart) due to the lower GDP, or well above the actual ratio of 177% in that year. 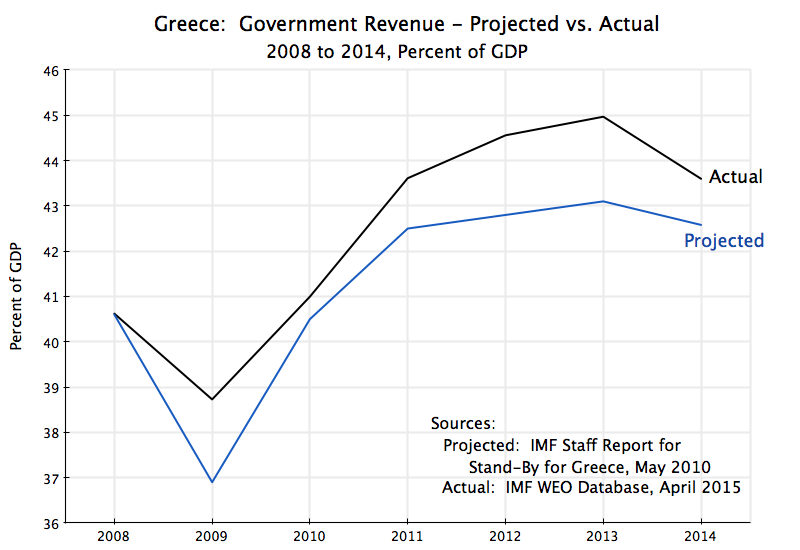 One cannot argue that Greece failed to abide by its government expenditure and revenue commitments sought in the IMF program. Indeed, it over-performed. But the program failed, and failed dramatically, because it did not recognize that by implementing such austerity measures, GDP would collapse. The program was fundamentally flawed in its design. For countries who have their own currency, but who borrow in a foreign currency, crises will normally manifest themselves through a balance of payments crisis. This is not central in Greece as it does not have its own currency (it is in the Eurozone) and almost all of its public borrowing has been in euros. Still, it is of interest that the current account balance of Greece (exports of all goods and services less imports of all goods and services) moved from a massive deficit of over 14% of GDP in 2008 to a surplus in 2013 and 2014. Relative to 2010, Greek exports of goods and services (in volume terms) were 12% higher in 2014, while Greek imports were 19% lower. 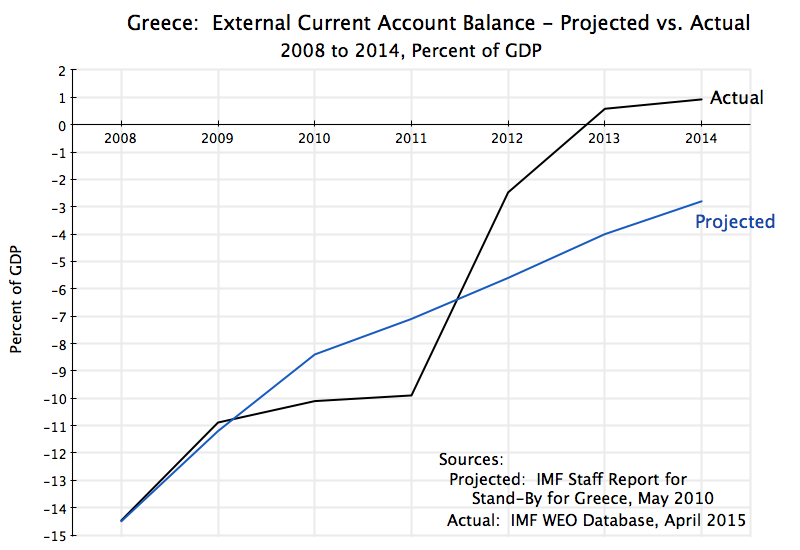 The IMF had projected that the external current account would still be in deficit in those years. This shift was achieved despite Greece not being able, as part of the Eurozone, to control its own exchange rate. The rate relative to its Eurozone partners is of course fixed, and the rate relative to countries outside of the Eurozone is controlled not by events in Greece but by policy for the Eurozone as a whole. Rather, Greek exports rose and imports fell because the economy was so depressed that domestic producers who could export did, while imports fell in line with lower GDP (real GDP was 17.5% lower in 2014 than in 2010). Lower wages were central to this, and will be discussed further below. While the preliminary estimate is that unemployment then fell in 2014, most observers expect that it will go up again in 2015 due to the economic turmoil this year. And youth unemployment is at 50%. a) Do not continue doing what has failed so far: While it should be obvious, if a particular strategy has failed, one should stop pursuing it. Keeping the basic austerity strategy, with just a few tweeks, will not solve the problem. b) Do not make the austerity program even more severe: Most clearly, the austerity program has savaged the economy, and one should not make things worse by tightening it even further. Yet that is the direction that things appear to be heading in. Negotiations are now underway as I write this between the Government of Greece and the Troika on the extension of the austerity program. A focus is the government’s primary balance. The original IMF program called for a primary surplus of 3% of GDP in 2015, and that has been still the official program goal despite all the turmoil between 2010 and now. The IMF program (as updated in June 2014) then envisioned the primary surplus rising to 4.5% of GDP in 2016 and and again in 2017. Germany wanted at least this much, if not more. Even the official Greek proposal to the Troika of July 10 had the primary surplus rising over time, from 1% of GDP in 2015, to 2%, 3%, and 3 1/2% in 2016, 2017, and 2018, respectively. With the chaos this year, few expect Greece to be able to achieve a primary surplus target of even 1% of GDP (if one does not ignore payment arrears). And while the IMF estimate from this past spring was that the primary surplus in 2014 reached 1.5% of GDP (reflected in the chart above), this was a preliminary estimate, and many observers believe that updated estimates will show it was in fact lower. With even the Greek Government proposal conceding that an effort would be made to reach higher and higher primary balance surpluses, the final program as negotiated will almost certainly reflect some such increase. This would be a mistake. It will push the economy down further, or at least reduce it to below where it would otherwise be had the primary surplus target been kept flat. c) Do not negotiate over the stock of debt now: There has been much more discussion over the last month on a need to negotiate now, and not later (some assert), a sharp cut to the stock of Greece’s public debt outstanding. This was sparked in part by the public release on July 14 by the IMF of an updated debt sustainability analysis, which stated bluntly that the level of Greek public debt was unsustainable, that it could never be repaid in full, and that therefore a reduction in that debt will at some point be inevitable through some system of write-offs. 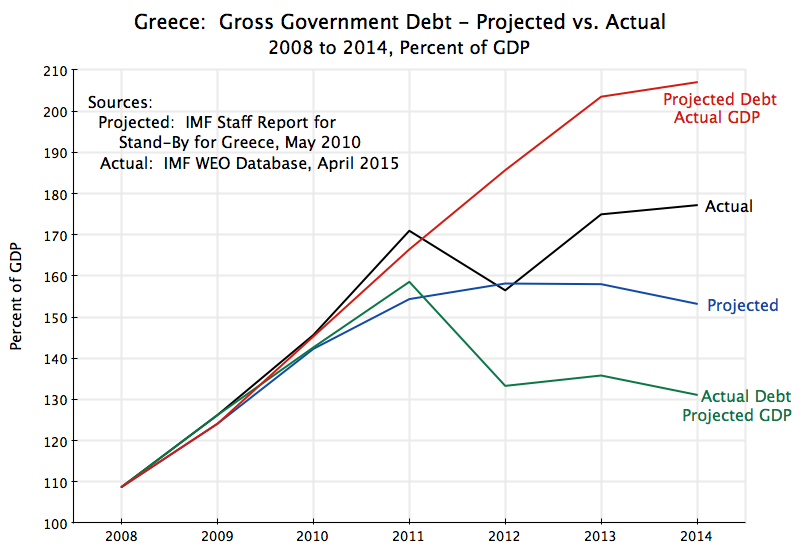 There is no doubt that Greek public debt is at an unsustainable level. Some portion will need to be written down. But I see no need to focus on that issue now, with the economy still deeply depressed and in crisis. Rather, a moratorium on debt service payments (both principal and interest) should be declared. The notional debt outstanding would then grow over time at the rate of interest (interest due in effect being capitalized). At some future point, when the economy has recovered and with unemployment at more normal levels, there can be a negotiation on what to do about the debt then outstanding. One will know only at that point what the economy can afford to pay. Note that such a moratorium on debt service is fully and exactly equivalent to debt service payments being paid, but out of “new” loans that cover the debt service due. This has been the approach used so far, and the current negotiations appear to be calling for a continuation of this approach. Such “new” lending conveys the impression that debt service continues to be paid, when in reality it is being capitalized through the new loans. Little is achieved by this, and it wastes scarce and valuable time, as well as political capital, to negotiate over such issues now. d) Structural reforms can wait: There is also no doubt that the Greek economy faces major structural issues, that hinder performance and productivity. There are undoubtedly too many rules and regulations, inefficient state enterprises in key sectors, and codes that limit competition. They do need to be reformed. But there is a question of whether this should be a focus now. The economy is severely depressed, with record high unemployment (similar to the peak rates seen in the US during the Great Depression). Measures to improve productivity and efficiency will be important to allow the full capacity level of Greek GDP eventually to grow, but the economy is currently operating at far below full capacity. The priority right now should be to return employment to close to full employment levels. One needs also to recognize that many of the measures that would improve efficiency will also have the immediate impact of reducing rather than raising employment. Changing rules and regulations that will make it easier to fire workers will have the immediate impact of reducing employment, not raising it. Certain state enterprises undoubtedly should be privatized, and such actions can improve efficiency. But the immediate impact will almost certainly be cuts in staffing, not increases. Structural reforms will be important. But they are not the critical priority now. And far more knowledgeable commentators than myself have made the same point. Former Federal Reserve Board Chairman Ben Bernanke made a similar point in a recent post on his blog, although more diplomatically and speaking on Europe as a whole. Finally, a few things to do, although it is likely they will not be politically feasible. a) Allow the primary balance to fall to zero, and then keep it there until the economy recovers: As discussed above, the program being negotiated appears to be heading towards a goal of raising the primary surplus to 3 1/2% of GDP or more over the next few years. The primary balance appears to have been in surplus in 2014 (the preliminary IMF estimate was 1.5% of GDP, but this may well be revised downwards), with a surplus also expected in 2015 (although the likelihood of this is now not clear, due to the chaotic conditions). To raise it further from current levels, the program will call for further tax increases and government expenditure cuts. This will, however, drive the economy down even further. Keeping the primary balance at zero rather than something higher will at least reduce the fiscal drag that would otherwise hold back the economy. Note also that a primary balance of zero is equivalent to a moratorium on debt service payments on public debt, which was discussed above. Interest would then be fully capitalized, while no net amount will be paid on principal. b) Germany needs to take actions to allow Greece (and the Eurozone) to recover: While I am under no illusion that Germany will change its domestic economic policies in order to assist Greece, the most important assistance Germany could provide to Greece is exactly that. The fundamental problem in the design of the single currency system for the Eurozone system was the failure to recognize as critically important that Europe does not have a strong central government authority, with direct taxing powers, that can take action when the economy falls into a recession. When a housing bubble bursts in Florida or Arizona, incomes in those states will be supported by US federal authorities, who will keep paying unemployment compensation; pensioners will keep receiving their Social Security and Medicare; federal transfers for education, highway programs, and other such government expenditures will continue; and if there is a national economic downturn (and assuming Congress is not controlled by ideologues opposed to any such actions) then stimulus measures can be enacted such as increased infrastructure spending. And the Federal Reserve Board can lower interest rates to spur investment. All of this supports demand, and keeps demand (and hence production and employment) from falling as much as it otherwise would. This can then lead to a recovery. The European Union in current form is not set up that way. Central authority is weak, with no direct taxing powers and only limited expenditures. Members of the Eurozone do not individually control their own currency. If a member country suffers an economic downturn and faces limits on either what it can borrow in the market or in how much it is allowed to borrow in the market (by the limits set in the Fiscal Compact that Germany pushed through), it will not be able to take the measures needed to stabilize demand. Government revenues will decline in the downturn. Any such borrowing limits will then force government expenditures to be cut. This will lead to a further downward spiral, with tax revenues falling again and expenditures then having to be cut again if borrowing is not allowed to rise. Greece has been caught in exactly such a spiral. As was discussed some time ago on this blog, even Professor Martin Feldstein (a conservative economist who had been Chairman of the Council of Economic Advisers under Reagan) said such fiscal rules for the Eurozone could “produce very high unemployment rates and no route to recovery – in short, a depression”. That is exactly what has happened in Greece. The EU in its present form cannot, by itself as a central entity, do much to resolve this. However, member countries such as Germany are in a position to help support demand in the Eurozone, if they so wished. But they don’t. Germany had a current account surplus of 7.5% of GDP in 2014, and the IMF expects it will rise to 8.4% of GDP in 2015. Germany’s current account surplus hit $288 billion in 2014, the highest in the world (China was second, at $210 billion). German unemployment is currently about 5%, but inflation is excessively low at 0.8% in 2014 and an expected 0.2% in 2015. It could easily slip into the deflationary trap that Japan fell into in the 1990s that has continued to today. To assist Greece and others in the Eurozone, Germany could do two things. First, it could accede to the wage demands of its principal trade unions. Germany’s largest trade union, IG Metall, had earlier this year asked for a general wage increase of 5.5% for 2015. In the end, it agreed to a 3.4% increase. A higher wage increase for German workers would speed the day to when they were in better alignment with those in Greece (which have been dropping, as we will discuss below) and others in the Eurozone. Inflation in Germany would likely then rise from the 0.2% the IMF forecasts for 2015, but this would be a good thing. As noted above, inflation of 0.2% is far too low, and risks dipping into deflation (prices falling), from which it can be difficult to emerge. Thus the target set in the Eurozone is 2%, and it would be good for all if German inflation would rise to at least that. Direct fiscal spending by Germany would also help. It has the fiscal space. This would spur demand in Germany, which would be beneficial for countries such as Greece and others in the Eurozone for whom Germany is their largest or one of their largest export markets. Inflation would likely rise from its current low levels, but as noted, that would be good for all. Of even greater direct help to Greece would be German support for EU programs that would provide direct demand support in Greece. An example might be an acceleration of planned infrastructure investment programs in Greece, bringing them forward from future years to now. Workers are unemployed now. Bringing such programs forward would also be rational even if the intention was simply to minimize costs. Unemployed workers and other resources are now available at cheap rates. They will be more expensive if they wait until the economy is close to full employment, so that workers have an alternative. Economically, the opportunity cost of hiring workers now is extremely low. A more balanced approach, where adjustment is not forced solely on depressed countries such as Greece but in a more balanced away between countries in surplus and those in deficit, would speed the recovery. Far more authoritative figures than myself (such as Ben Bernanke in his blog post on Greece) have made similar arguments. But Germany shows little sign of accepting the need for greater balance. With Germany not changing its stance, and with the Troika now negotiating an extension and indeed deepening of the austerity program Greece has been forced to follow since 2010 (in order to be allowed to remain in the Eurozone), the most likely scenario is that conditions will continue along the lines of what they have been so far under this program. The economy will remain depressed, unemployment will remain high, government revenues will fall in euro terms, and this will then lead to calls for even further government expenditure cuts. One should not rule out that at some point some event occurs which leads to a more immediate collapse. The banking system could collapse, for example. Indeed, many observers have been surprised that the banking system has held up as well as it has. Liquidity support from the European Central Bank has been critical, but there are limits on how much it can or will be willing to provide. Or a terrorist bomb at some resort could undermine the key tourism industry, for example. Absent such uncontrollable shock events, there is also the possibility that at some point the Government of Greece might decide to exit the Eurozone. This would also create a shock (and any such move to exit the Eurozone could not be pre-announced publicly, as it would create an immediate run on the currency), but at least some argue that following the initial chaos, this would then make it possible for Greece to recover. The way this would work is that the new currency would be devalued relative to the euro, and by law all domestic transactions and contracts (including contracts setting wages of workers) would be re-denominated into the new currency (perhaps named the “new drachma” or something similar). With a devaluation relative to the euro, this would then lead to wages (in euro terms) that have been reduced sharply and immediately relative to what they were before. The lower wages would then lead to Greek products and services that are more competitive in markets such as Germany, leading to greater exports (and lower imports). This is indeed how countries with their own currencies normally adjust. It would, however, be achieved only by sharply lower wages. It would also likely be accompanied by chaotic conditions in the banking system and in the economy generally in reaction to the shock of Eurozone exit. Greece would also likely cease making payments of interest and principal on its government debt (payments that are due in euros). This plus the exit from the Eurozone would likely sour relations with Germany and others in the Eurozone, at a time when the country needs help. So far Greece has resisted leaving the Eurozone. Given what it has accepted to do in the Troika program in order to stay in the Eurozone (with the resulting severely depressed economy), there can be no doubt that this intention is sincere. 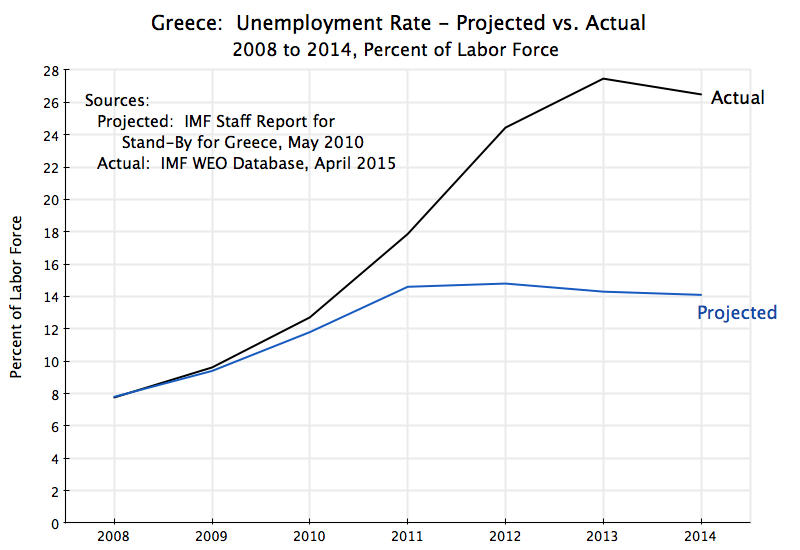 Assuming then that Greece does stay in the Eurozone, what will likely happen? Assuming no shocks (such as a collapse of the banking system), it would then be likely that the economy would muddle along for an extended period. It would eventually recover, but only slowly. The process would be that the high unemployment will lead to lower and lower wages over time, and these lower wages would then lead to Greek products becoming more competitive in markets such as Germany. This is similar to the process following from a devaluation (as discussed above), but instead of this happening all at one point in time, it would develop only gradually. The process has indeed been underway. The key is what has happened to wages in Greece relative to where wages have gone in its trading partners. One needs also to adjust for changes in labor productivity. The resulting measure, which economists call nominal unit labor costs, measures the change in nominal wages (in euro terms here), per unit of effective labor (where effective labor is hours of labor adjusted for productivity growth). While one cannot easily compare unit labor costs directly between countries at the macro level (it would vary based on employment composition, which differs by country), one can work out how much it has changed in one country versus how much it has changed in another country, and thus how much it has changed for one country relative to another. 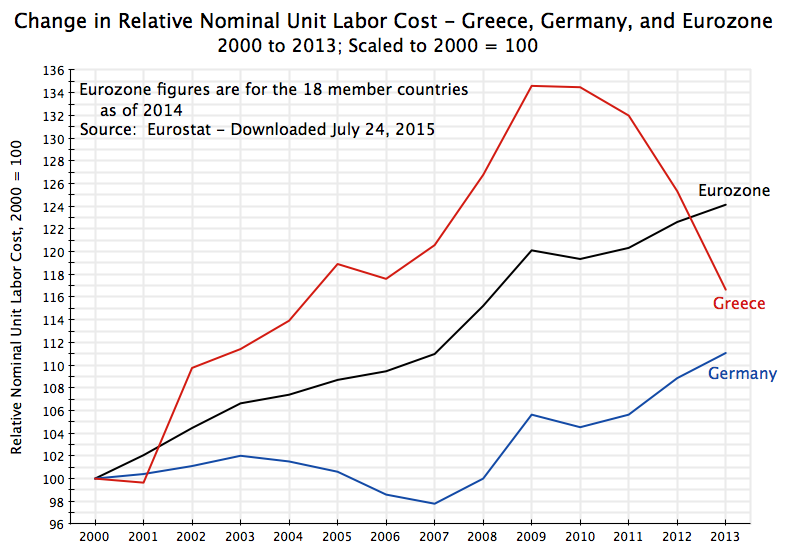 Relative to 2010, nominal unit labor costs fell by 13% in Greece (up to 2013, the most recent date available). Over that same period, they rose by 4% in the Eurozone as a whole and by 6% in Germany. Thus relative to Germany, unit labor costs in Greece were 18% lower in 2013 than where they were in 2010. This trend certainly continued in 2014. The lower unit labor costs in Greece have led to increased competitiveness for the goods and services Greece provides. Using the IMF WEO database figures, the volume of Greek exports of goods and services grew by a total of 12% between 2010 and 2015, while the volume of imports fell by 19%. As noted in a chart above, the Greek current account deficit went from a large deficit in 2010 to a surplus in 2013 and again in 2014. Greater exports and lower imports have helped Greek jobs. And as seen in another chart above, Greek unemployment fell a bit in 2014 (although with the recent chaos, is probably rising again now). This process should eventually lead to a recovery. But it can be a slow and certainly painful process, and is only achieved by keeping unemployment high and wages falling. Are Greek wages now low enough? Changes in unit labor costs cannot really provide an answer to that. As noted above, the figures can only be provided in terms of changes relative to some base period. The base period chosen may largely be arbitrary. The chart above was drawn relative to a base period of 2010, as that was the first year of the austerity program, but cannot tell us how much (and indeed even whether) wages were out of line with some desirable relative value in 2010. And one can see in the chart above that Greek unit labor costs were rising more rapidly than unit labor costs in the Eurozone as a whole in the period prior to 2010, and especially relative to Germany. The data is the same as before, and simply has been adjusted to reflect a different base year. 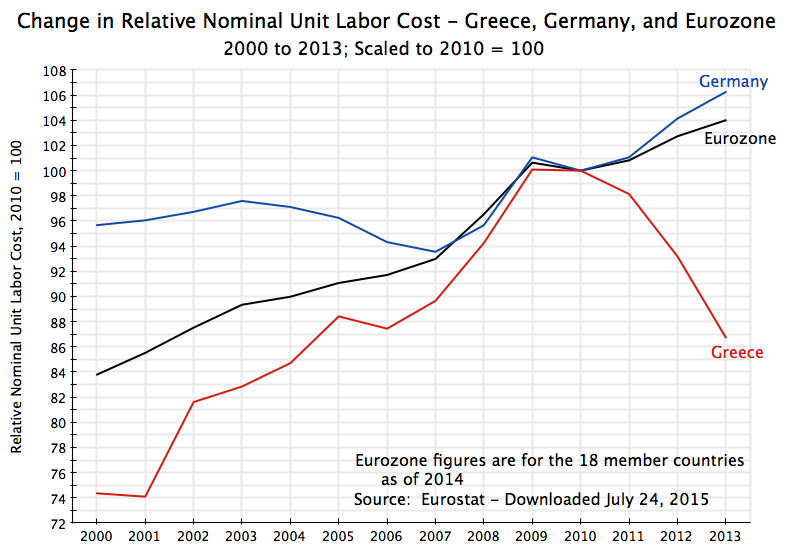 Relative to where they were in the year 2000, Greek unit labor costs in 2013 were below what they were for the Eurozone, but only starting in 2013: They were higher for each year from 2002 to 2012. And they were still above the change in Germany over the period: German unit labor costs were 11% higher in 2013 than where they were in 2000, while Greek unit labor costs were 17% higher (but heading downwards fast). Wages are therefore adjusting in Greece, and indeed adjusting quite fast. This is leading to greater exports and lower imports. Over time, this will lead to an economic recovery. But it will be a long and painful process, and it is difficult to predict at this point how long this process will need to continue until a full recovery is achieved. Unless the depressed conditions in the country lead to something more radical being attempted, this is probably the most likely scenario to expect. The recovery could be accelerated if Greece were allowed to keep the primary balance flat at say a zero balance (implying all interest on its public debt would be capitalized, and no net principal paid) rather than increased. But this will depend on the acquiescence of the Troika, and in particular the agreement of Germany. It is difficult to see this happening.